tag: BeYouBling: June is a fantastic time to join Paparazzi!! Paparazzi Accessories is fun and fashion-forward $5 jewelry and hair accessories. I am a Producer and Trainer with the company and I absolutely love it. You can sell Paparazzi from virtually anywhere from home parties, events, Facebook parties, basket parties, assisted living facilities, garage sales & so much more. I would love to answer any questions you have and help you get your Paparazzi journey started. 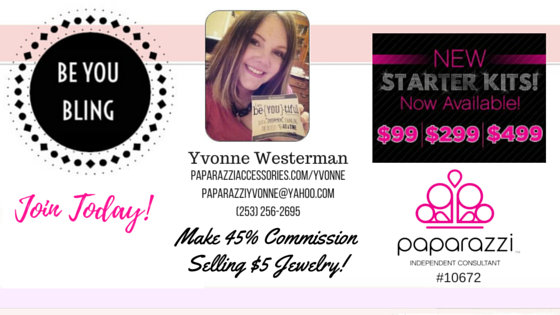 www.paparazziaccessories.com/yvonne to join today! June is a fantastic time to join Paparazzi!! This is your lucky break! You are looking into Paparazzi Accessories at the perfect time!!! From now until the end of the month of June, when you join the company with a starter kit, you will get 25 FREE pieces of jewelry with your kit. That is an extra $125 of value, profit and equity you start with! I've been a consultant for almost 2 years and this is the BEST promotion I have seen on starter kits yet!!!!! Contact me to get started or to get more info!!!! 253-256-2695 or yvonnejams@yahoo.com. OR listen to one of our opportunity nights (see below)! 5pm PST, 6pm MST, 7pm CST, 8pm EST. This call will be about 30-45 minutes and will be filled with inspiring success stories, details about Paparazzi and information about the support one gets from joining this team. The link to this event is https://www.facebook.com/events/268882423284468/. Join our team for an hour and read our stories, our successes, the main points about Paparazzi, and information about the compensation plan. FREE jewelry will be given away. If you can't make it live, that is ok. The event will be up for a while you can read over when you want!